« Windows Mobile: SetSystemTime and DST, Einstein’s Relativity Theory? So you may use these SoftKeys to enable the user to start your Kios application. You should be aware of that if you dont have a key assigned to VK_LWIN (the Win key), you will never be able to switch to the Start Menu or now called Home Screen! If an application is started and does not have a Exit menu, you will not be able to get back to the today screen. If you disable the TitleBar (HHTaskbar) you will also not be able to open any of the settings and informations available thru the TitleBar (ie battery status, clock settings, volume settings). The TitleBar normally will get a “Start Menu” entry to the left. But with TextmodeEnabled=1 this will not be the case! So no way back to Today Screen and no way to get to the Start Menu with all the programs or the Home Screen. code removed as two other comments with the lengthy code. 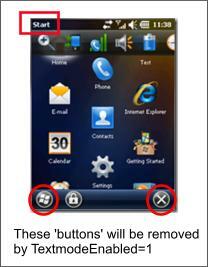 can we hide the start button on a windows Mobile 6.1 device….possible or not??? please help….i have search every where but can’t fine it…. can registry disable softkey on blackstone (answer, home, back and DLL)????? you can do whatever you want with the start button as soon as you have the window handle. It is just a matter of subclassing. Most of kiosk mode apps are full screen and so the start button on the screen does not matter. To disable the ‘soft’ keys, you may use AllKeys(TRUE) in your app or play with my “Free the function keys”. The latter uses unregisterHotkeys() API. All the softkeys are implemented using function key codes (F1, F2 and so on). But this is basic stuff and you should be aware of this when you are trying to make a kiosk mode app. this code is not working for me. b) despite from that, the reg keys should already exist and not needed to be created. oooooops, I’m really really sorry. after a reboot, it works perfectly now ! wow !!!! any idea on how to make this operation automatic ? This seems like a lot of work and has potential for locking out the device. The winproc process is definitely a lot of work and the menu bar is still there taking up valuable screen realestate. Plus the menu bar is still displayed, but is just non functioning. I simply deleted the menu from the window and replaced it with buttons. The window state is set to maiximized. 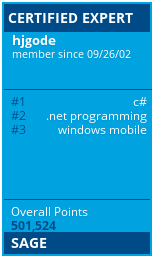 When the application runs, now it functions like on WM 6.5.1 – no start button, no close button and no menu and the application window takes up the entire screen (kiosk). We have an admin function in the application that allows an administrator with credentials to exit the application and access the device for maintenance/trouble shooting. Since the registry hasn’t been changed, device maintenance can be performed easily. a) this is a very simple solution and can be done easily. Just change the registry and reboot. b) the menu is still usable and working. Only the Start and Close icons are removed. c) yes, there are many ways to get a kiosk mode app. If one does not need a working menu bar, he/she can start a fullscreen approach without any OS driven menu bar. But actually I dont know the class name of the top bar. You have to find the class name of the top bar (ie using zDump or simply RemoteSpy included with VS. Then you can use the above code to catch click events on the top bar. Thanks for the reply. We had tried this earlier. When we try to subclass the “HHTASKBAR”. We are not getting the message (wndproc) on clicking of the top toolbar. MS changed the memory model and now the processes do not any more share the same 2GB address space (starting with WinMo6). Subclassing the HHTaskBar windows seems to work only up to Windows Mobile 5. Possibly you can inject a DLL, but how would you then intercept messages from your main code? Can you please tell us how to inject the dll. The exe will be in background. Before this injecting dll concept we thought that when the user clicks on the taskbar. Exe will get the message(as it would have hooked for the click event on taskbar.) and bring the exe foreground. Thanks for the article. I am looking for the solution how can I disable the Start and Done buttons. I really don’t want to hide them. I want both buttons to be displayed, but they will not do anything if clicking on those buttons. I need the steps to disable/remove the menu shortcuts in the menubar at the bottom i.e. Phone and Contacts. Please suggest how to use the below registries. In CHome, I don’t see SK1URL and under Today there is no Keys\112 registry. DO we need to create this? What value to be specified for ? this post is not about the menu tiles. You can assign the menu tiles on today screen to different applications, but I did not yet see a request to disable them completely (although this might be possible looking for the right window and disable/hide it). I have seen people assign the home screen menu tiles to there kiosk mode apps. Is there a way to put back the Start & Done button to the Top Task/Title Bar? there is no way to get the (X) button into the top bar. AFAIK there is no such API. I would create a small tool that adds a window with (X) or (back) to the top bar. The window or button can then be clicked and should send a WM_Close to the active foreground window. This way it simualtes what the (x) in the menu bar does. Or you assign a key to send WM_Close/WM_Hide to the foreground window.